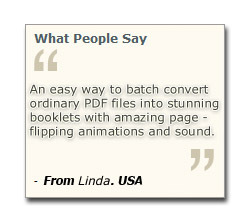 Batch convert PDF files to flippingbook with amazing page-flipping animations and sound! 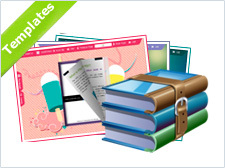 Flip Shopping Catalog is software to convert PDF files to flip magazine which you can publish online or share with your clients in emails, Facebook, Twitter directly. With using the powerful digital ebook builder, you can easy add many kinds of multi-media on pages, like Flash prices, shopping cart images, sales icons, presentation video, brand audio, shopping links, product photo slideshow, etc. Just need simple clicks on these page edit items, no Flash or Programming technology required, the Flip Shopping Catalog will help to pack your digital shopping magazines into professional ebooks under your own control. The book readers just need Flash Player installed in browser. No other additional reader needed. Unlimited numbers of books, catalogs you can build with using the software, all without paying royalties. 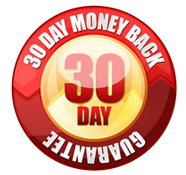 Furthermore, all later upgrade versions are free to you users, no matter we will raise price of the program or not. Flip Shopping Catalog not only support single and batch conversion modes, But also provides a Command Line mode to help you to automate the creation of the Flash eBooks without opening the Windows desktop application. The Command Line mode allows you to custom set multiple details and allows you to run console applications and batch files without any window in the background. 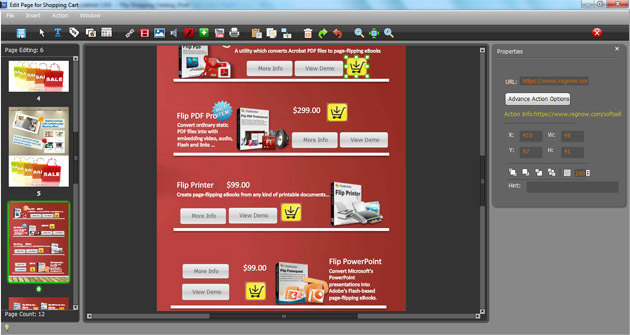 Flip Shopping Catalog is the easiest way to create digital magazine, brochure or catelogue from PDF files. No Flash or Programming technology required, the Flip Shopping Catalog will help to pack your digital shopping magazines with professional book reading features totally under your own control. There are many different output formats you can use in Flip Shopping Catalog, and the newest format is Mobile Version. After publishing HTML with Mobile version together, you can not only view your books on PC, MAC computer, iPad, iPhone and Android devices all supported. Strong and Flexible for your readers to shopping online. Flip Shopping Catalog is available for both Windows and Mac platforms, both have the full features available and allow you to create your digital publications in minutes. 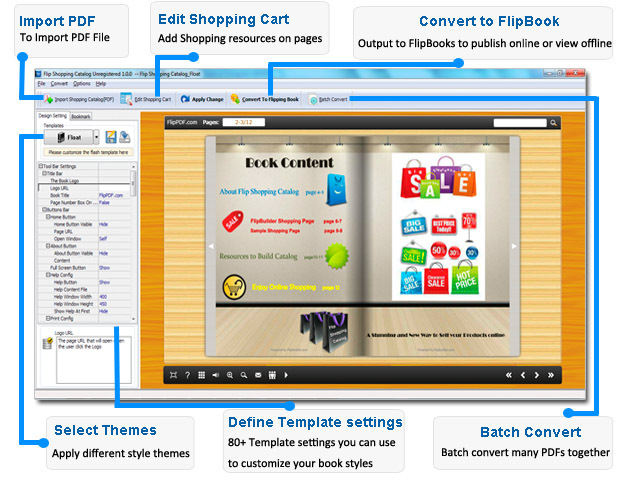 Want to put a native Flash or video file into the page-flipping eBook you are creating? YOU CAN! Would you like to add active links on the eBook without using the link edit tool of Acrobat Pro? YOU CAN! Flip Shopping Catalog allows you to edit imported PDF pages directly, including inserting links, images albums , movies, YouTube videos, sound and Flash files! It is a simple and effective way to catch your readers' attention and improve the experience when reading your publications. Customise the flippingbook look and feel of both the skin and interactive features by choosing from your preferred colors, background, sounds, layout, style, visual page transitions and button controls. The digital publications can match your brand so it really looks the part. Flip Shopping Catalog supports analyzing and importing table of contents from PDF' bookmark. After that, you can edit the imported table of contents. If you want to create it by yourself, instead of importing from PDF, or your PDF does not contain a table of contents, the program can help you to create table of contents for your digital publication. Here you can define a text link to each main category of your publication. The table of contents support unlimited links. If you have a Google Analytics account, you can make use of Flip Shopping Catalog’s built-in functionality Google Analytics Embedding. The code of Google Analytics can be embedded to each book and all statistics will be available from your Google Analytics account live. Create, design, control and increase your marketing effectiveness using Google Analytics within the publications. 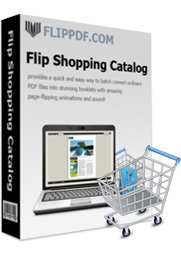 Flip Shopping Catalog is desktop software that you can locally install on a PC computer. Unlike other online PDF to Flash book services, it gives you total control of the whole production and has no limitations of the number of PDF files. With it, you can create as many interactive online publications as you wish for your own company or for your clients, and all features are included. .
High quality converting of PDF documents to web-ready flip magazine. Batch FlippingBook creating : Batch convert a bunch of PDF files to a single or multiple flip magazine.